A great morning indeed! The weather is changing, so I decided to head out early for some morning fishing. I had a lot of worms gathered in recent landscaping ventures. I went below the dam at Kittanning and wet some worms to see what I could catch. All told, I caught one smallmouth bass; one channel catfish; one flathead catfish; one sauger and one carp. I missed a few nice bites due to messing around with my camera or watching critters. Other wildlife sightings included; gulls; vulture; mergansers; mallards; various small birds and a big Norwegian Rat! I had to quit by 10:00 to go with my step father, Bob to pick up some cabinets for his garage. 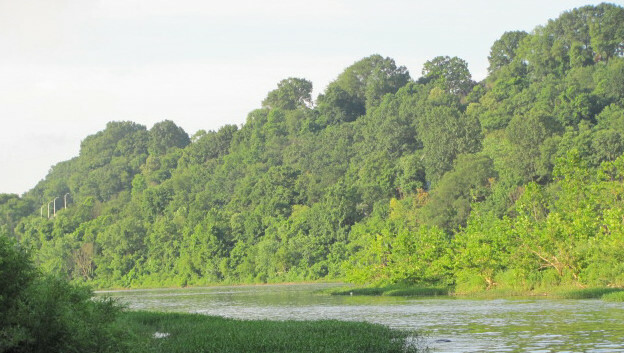 The stream with vegetation that was absent in earlier times due to a failure to understand natural world. People seem to enjoy my landscaping ideas for the most part. 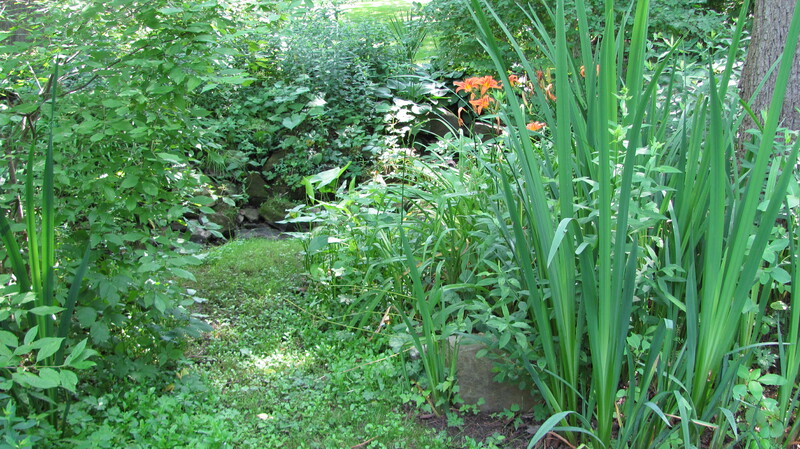 I tend to think “out of the box.” The stream that flows across my back yard was in a bad condition when I purchased the place in the later part of the 1980 decade. I could easily step across with little effort. 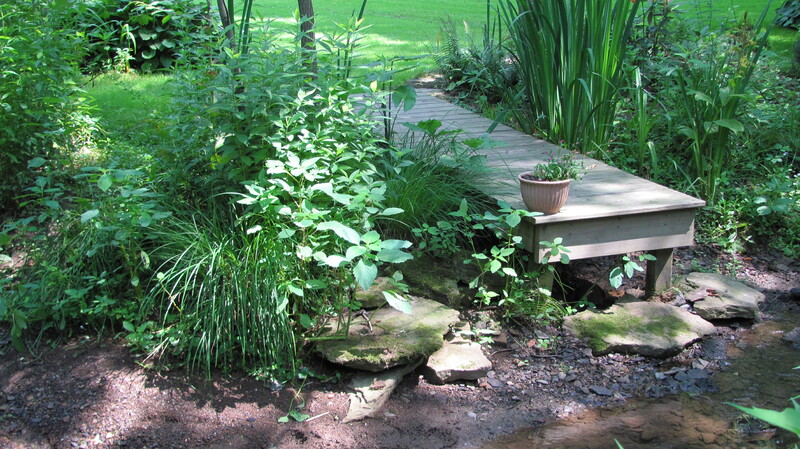 The top of the water was approximately six inches from the top of the yard making for easy flooding problems. The dock for dipping hot feet. 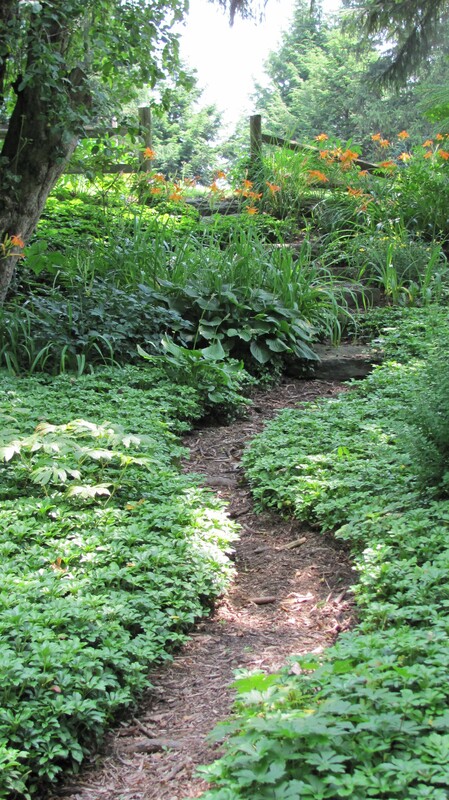 Another area has lush Pachysandra growth with a meandering trail. 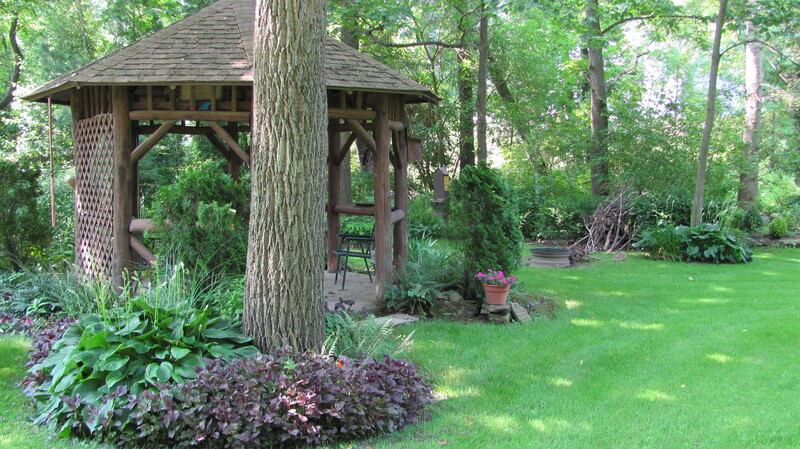 The gazebo area has a stone trail surrounded by flowers, etc. 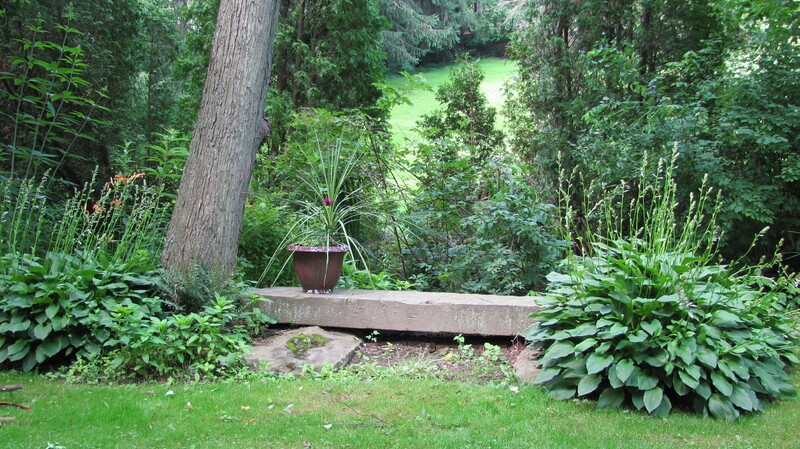 The rabbits and chipmunks are common here. My mother and new step-father were married in the gazebo last August of 2009. My brass light with its natural tarnished-patina. That is the way I want it so don’t be offering to polish it! 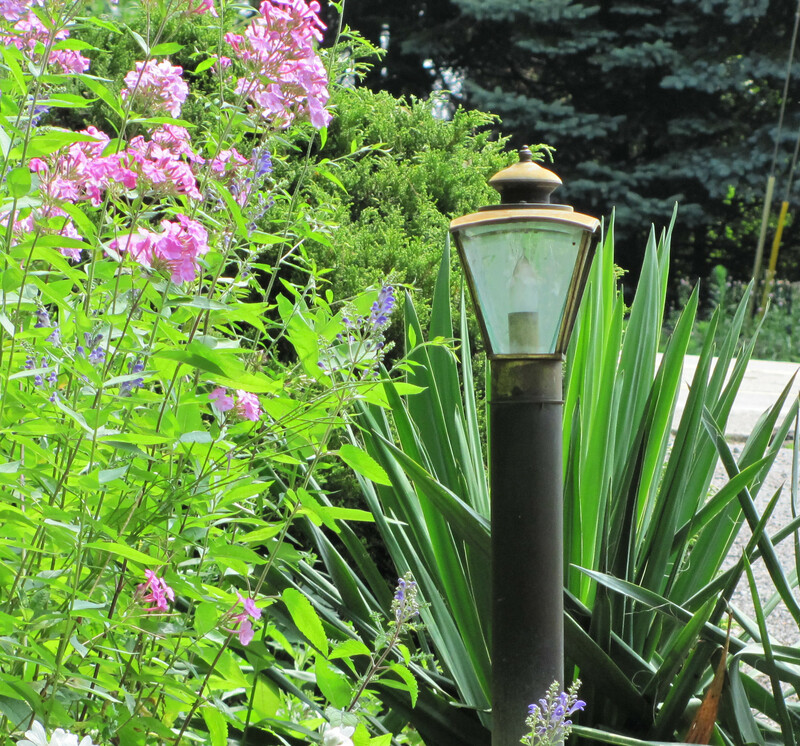 My intent with my landscaping is to create habitat for wildlife as well as to beautify my yard. I keep a count and to date I have identified 56 birds either on of flying over my place; 15 various mammals and 6 reptiles and/or amphibians. Hope you enjoy the photos. 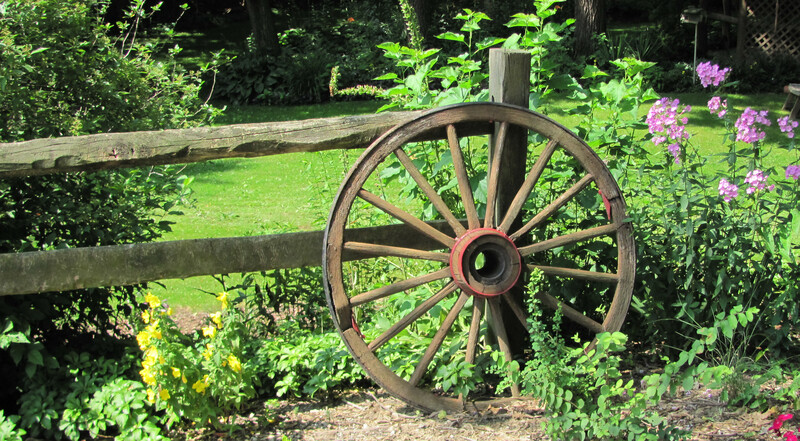 The wheel along the rail fence. 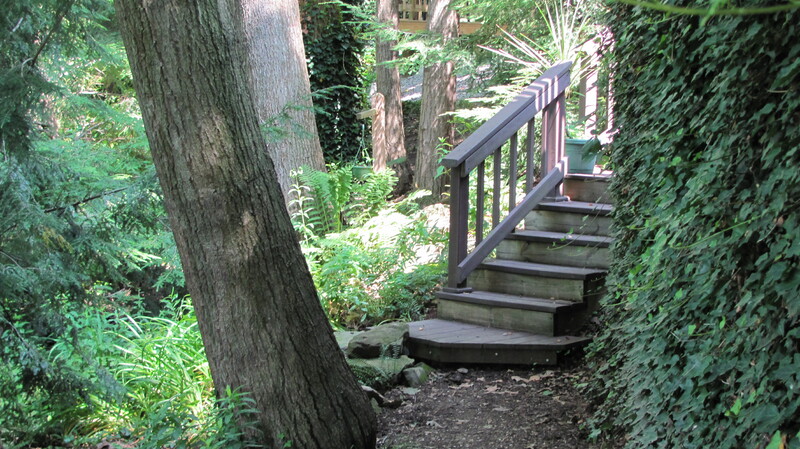 The main deck over the garage roof has an elaborate series of landings and steps that angled around to allow travel from the deck to the back yard. 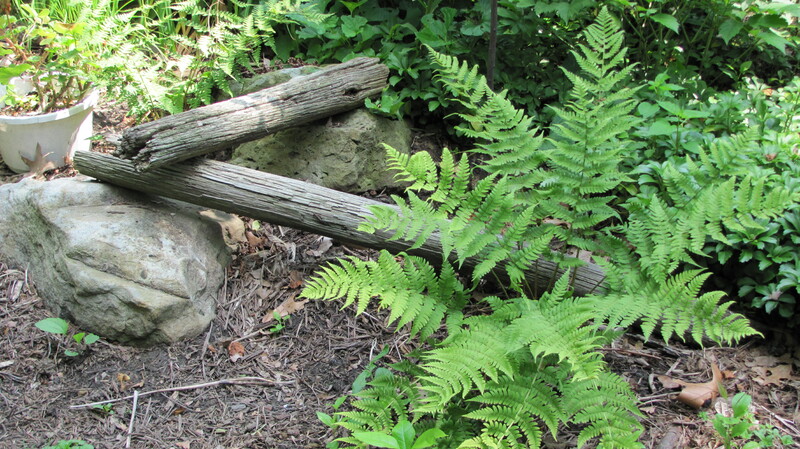 Fern among some weathered posts. A view along the Allegheny. 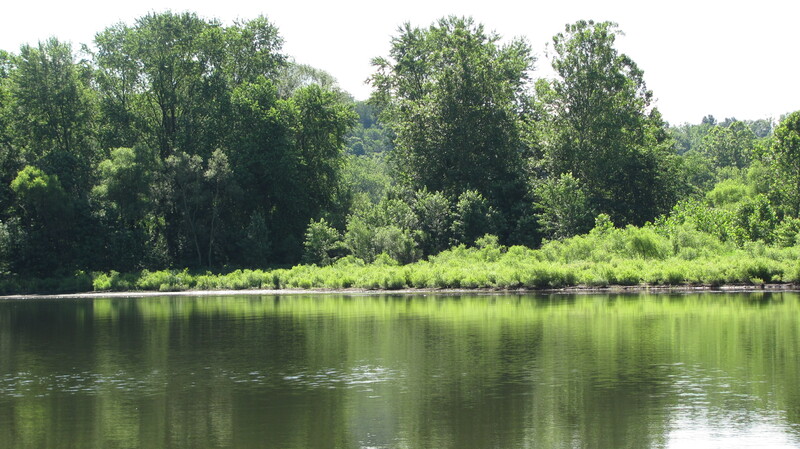 My good friend, Frank Maus and I spent some quality time fishing for that elusive muskie on the Allegheny River. Frankie is an exclusive muskie fisherman. 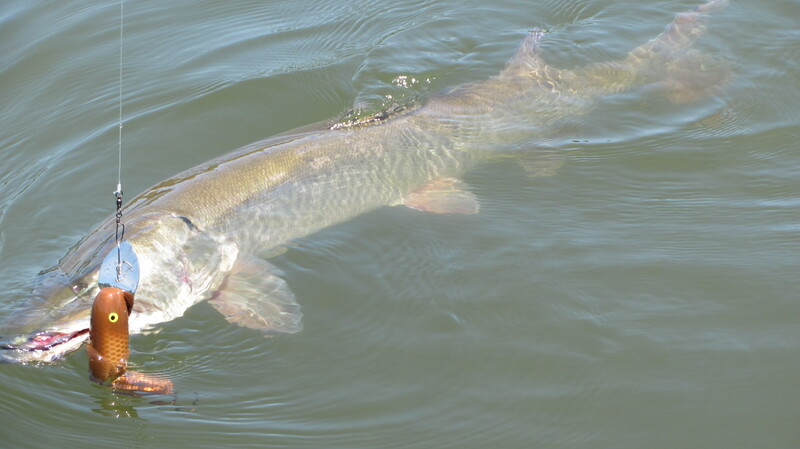 His determination is routinely proven by his knowledge and skill with that specie known as the muskellunge. He catches plenty of them. 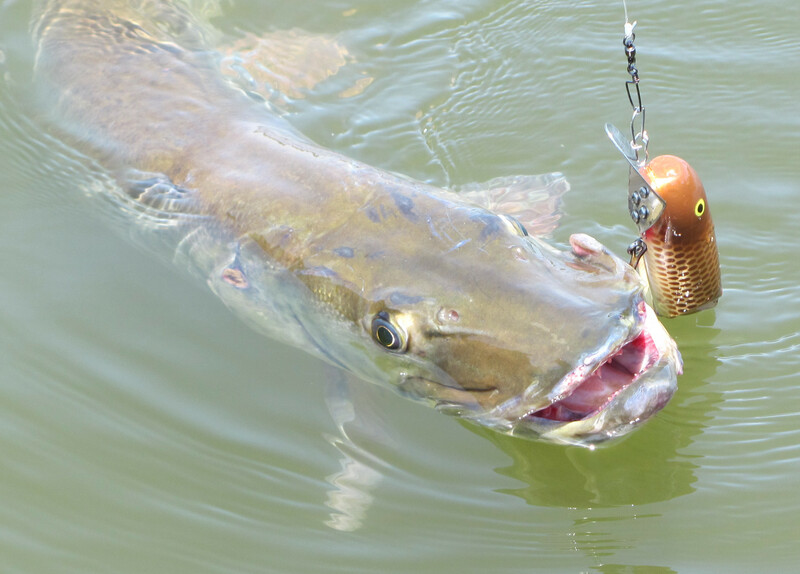 I have read in the past that some say catching this fish is the equivalent of 1000 casts per fish. That thought may be accurate! 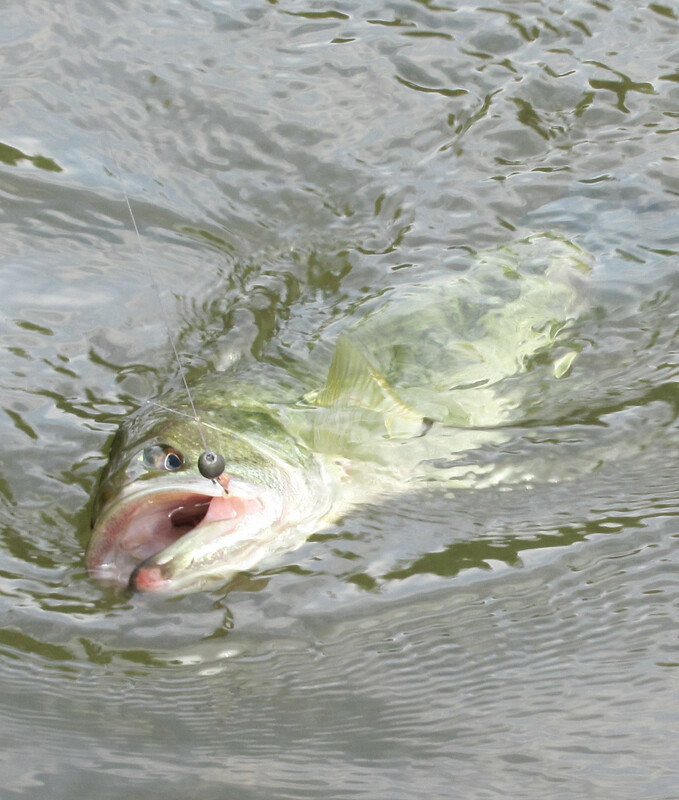 We began the fishing excursion by using surface plugs at a couple of spots. We fished this way for about one and a half hours before we starting trolling. The day, although later warm, was beautiful with blue skies and low humidity. We kept talking and discussing the old jobs we retired from and the laughs we used to experience there. Suddenly, the sound of line rapidly exiting a reel was heard. I remember saying , “Which pole?” There is always a small amount of time that occurs when this happens until your mind hones in on reality. Frank immediately sped up the boat to help set the hook. He grabbed the rod and the water exploded behind the boat and we both realized that a nice fish was on the end of the line. Frank landed the fish and I held the pole as he attempted to get an accurate measurement. 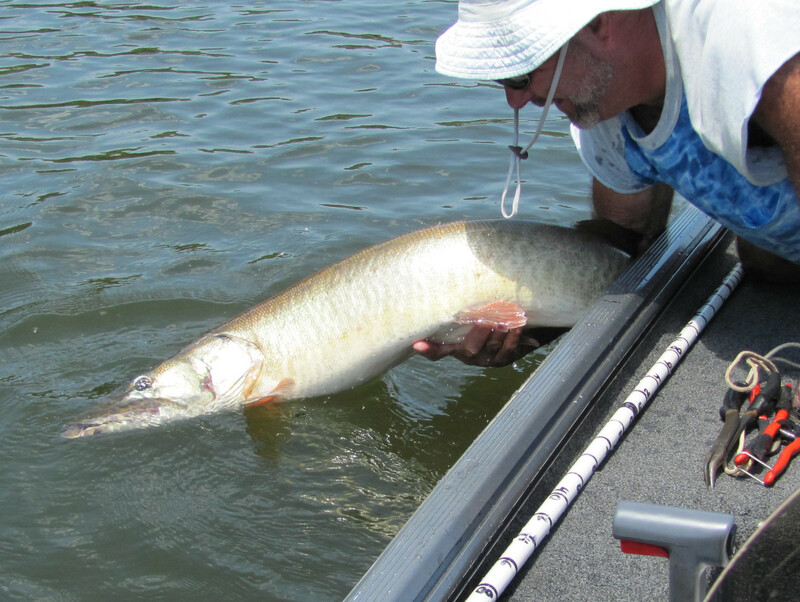 The muskie was at least 46 inches. 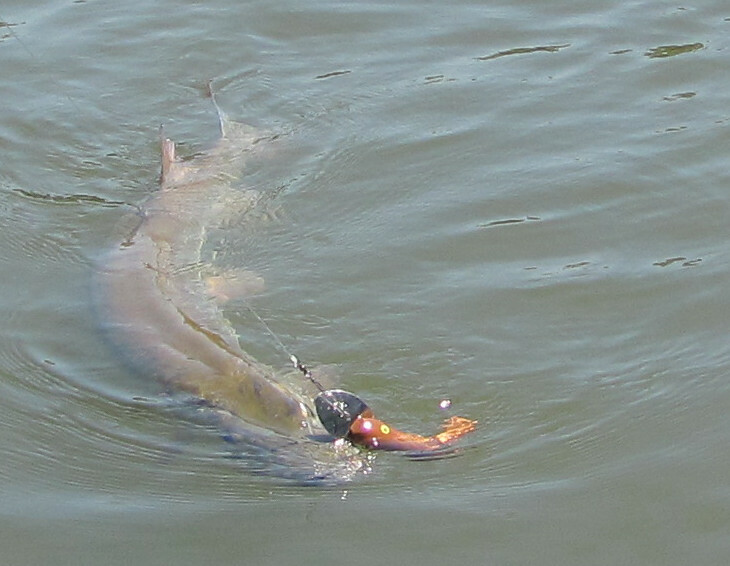 Have you ever tried to measure a fish of that size while it is yet in the water and moving? Frank always works at playing the fish for a short time, getting a photo; measuring and releasing it quickly. A sign of a true conservation-minded individual. Top of the line predator...notice the eyes and teeth. 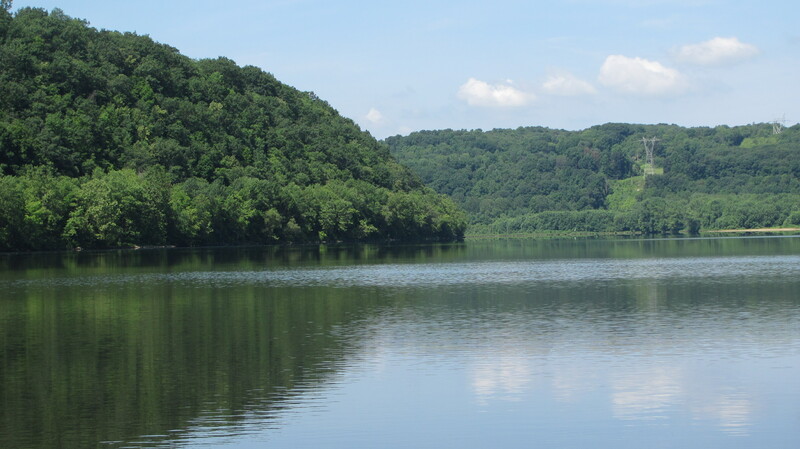 In earlier times, the Allegheny River was considered to be part of the Ohio River and was called such. 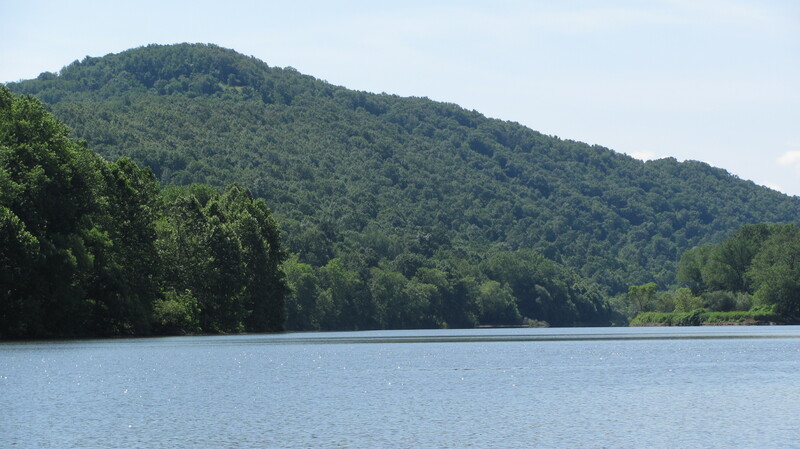 The French during the French & Indian War era (1754 -1758 ) called the Ohio River here, “La belle Riviere.” This meant, “The Beautiful River” in English. And a beautiful River it is! The plug is about 7 inches long.. to compare. By the way… I didn’t catch anything. Father’s day is not a happy day for me. On Father’s Day, June 20th, 1999, my father, Allen K. Smail, passed away unexpectedly. I was the one to meet my mother as she entered the hospital to stop her and tell her that my father (her husband) had passed away. So, you can imagine the emotions that occur each Father’s Day for me. This grief is still strong even after the eleven year expanse of time. I miss him. 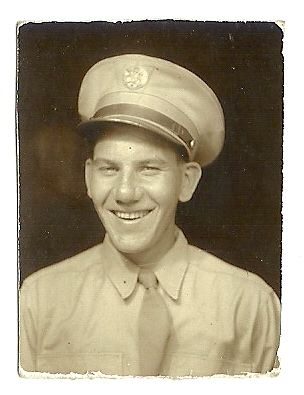 My father, Allen K. Smail as a young soldier in the Air Force. I am so proud of him! The other aspect of Father’s Day for me is the fact that I never became a father. I guess that fulfilling was not to be in the cards for me. But to all of you fathers .. I wish you all a Happy Father’s Day!! 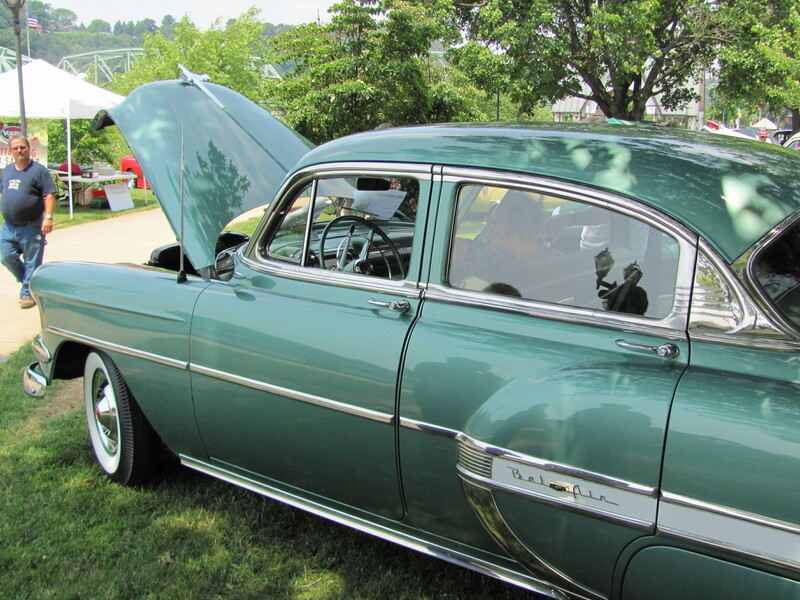 My step father, Bob Miller has owned this 1954 Chevy Belair for some thirty years. The car set in his garage waiting to be returned to the original luster and grandeur. As often happens in life, other commitments occur and one has to prioritize.Life was no different for Bob. Last spring the restoration process finally began to take shape. 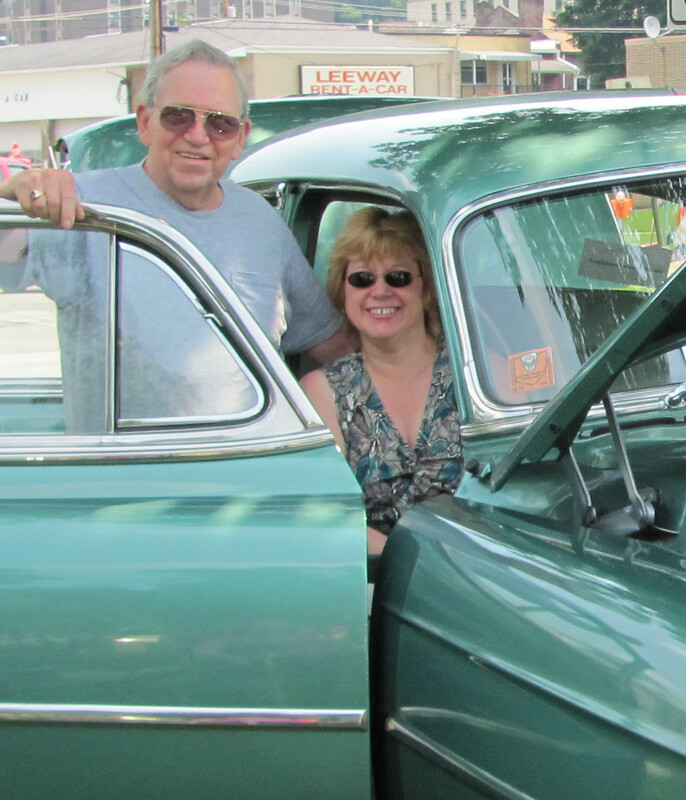 Bob and, my wife, Laurie with the '54 Chevy. 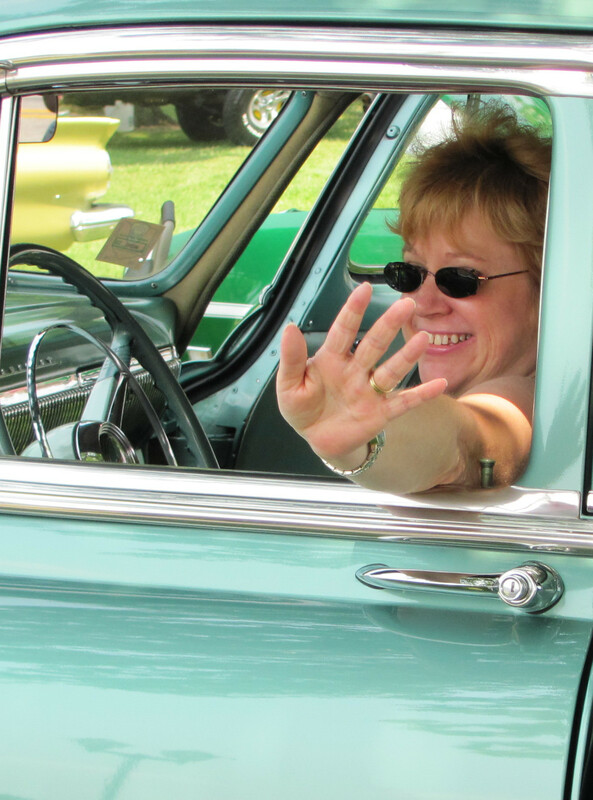 Laurie headin' out to the "malt shop". The car has around 26,000 original miles on it. The interior is as it was the day the car was first driven from the car dealership. All the needs to restore that original luster was to repaint the body and clean some of the chrome parts. A few needed to be re-chromed. 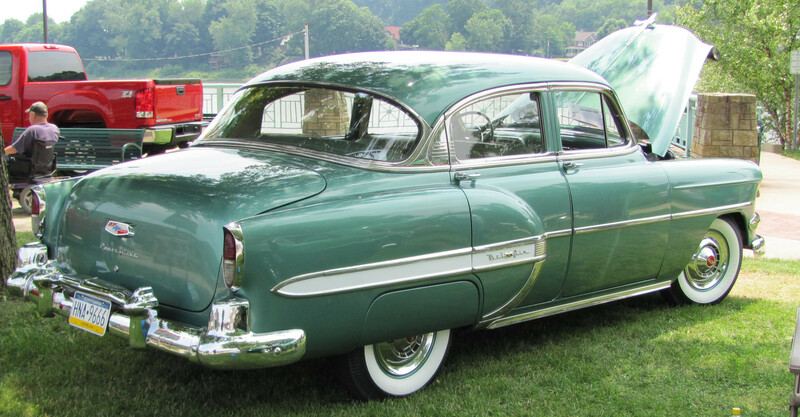 Cars from the 1950 era often used plenty of chrome. "Grease" is the word or memories of Sha Na NA! A few other things were done to the car. Some things from setting idle all those years needed to be replaced. For instance the tires were dried out, as well as, other rubber mouldings. John Baker of Whitesburg did the custom work, Great job! Laurie really enjoyed setting in a piece of history. 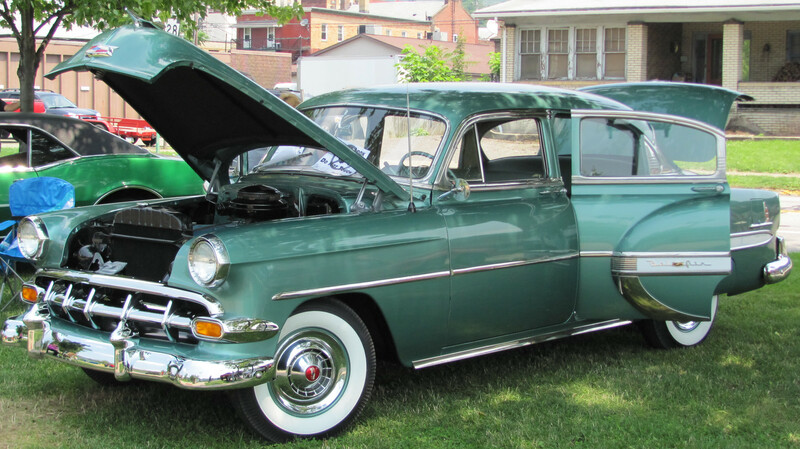 I hope you enjoy the photos of this classic car of days past. They “just don’t make ’em like this anymore”! Randy was opening a gate to the Heilman Lutheran Church’s Cemetary. He told me of over fifty tombstones being pushed over in the past. The gate helps keep individuals out of the area at night when the likelihood of such actions increase. 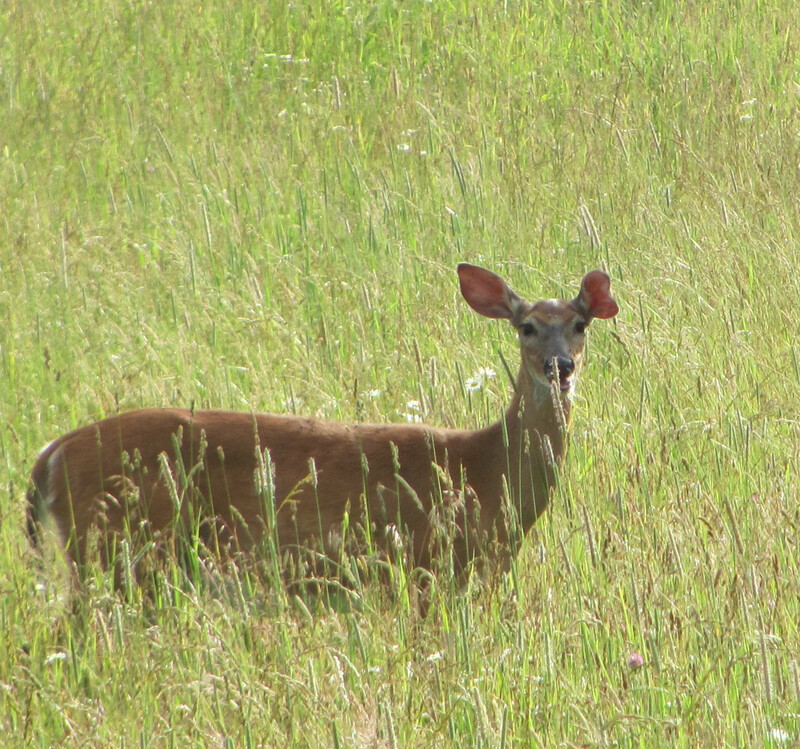 Doe with a deformed ear. 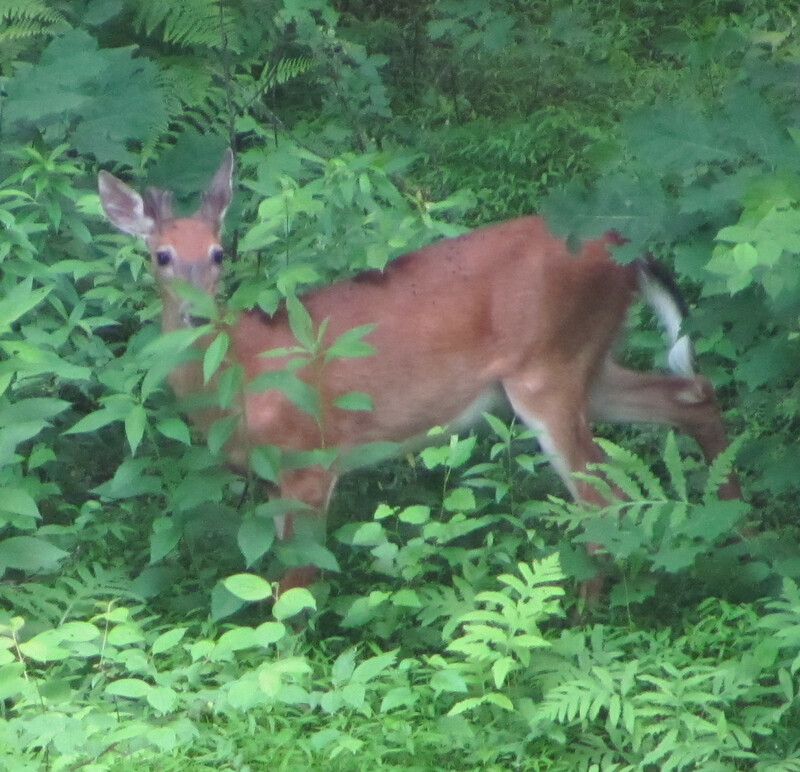 I had seen a number of deer during the jaunt. The peace and solitude is just what I needed. This area always delivers those important things of life. Another aspect of this morning was the nostalgic memories of the area. 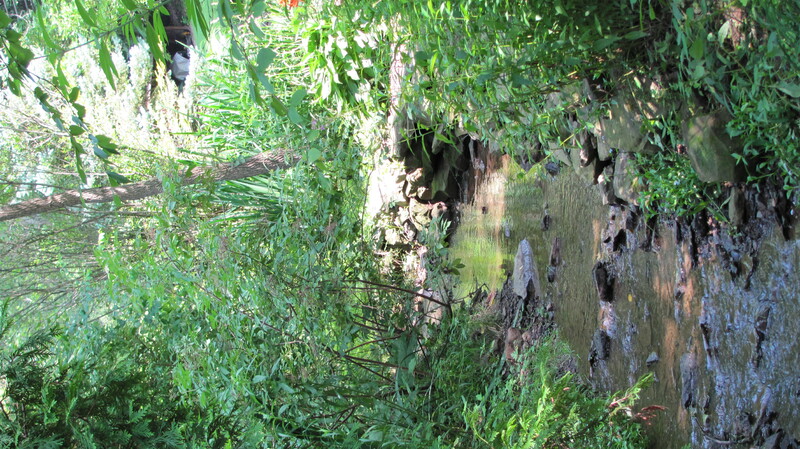 I have spent many hours along this creek. I remember, as a boy, when the waters of Crooked Creek ran orange with no fish life. Presently, the waters are clean and clear. A great accomplishment! Of course, I have many memories of my father and I here as well as my cousins. 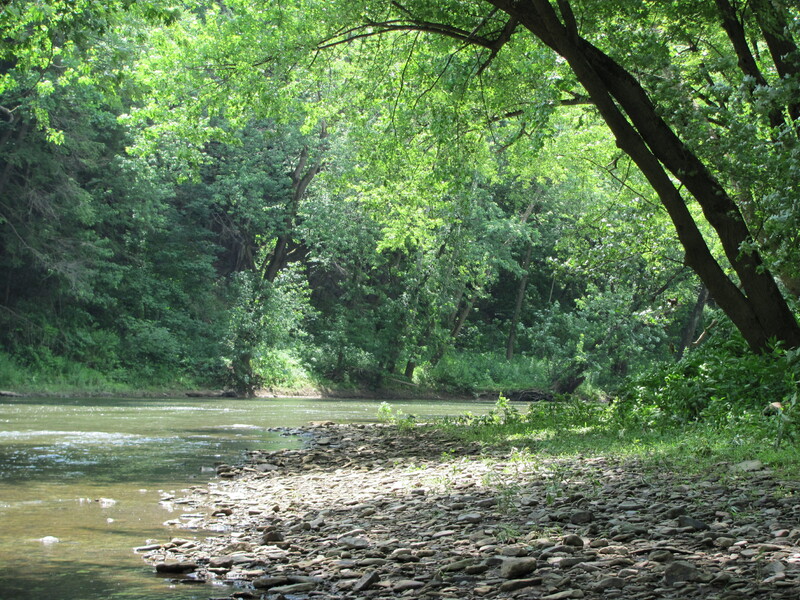 We always had enjoyable times along the waters of Crooked Creek. As a history enthusiast, I visualised the early natives and colonists drifting along in their canoes or dugouts. I, also, thought about the many people who had lived here at Cochran’s Mill prior to the dams being built. Life goes on! Recently I was rumbling through “stuff” in my parents’ attic. I discovered many things of my fathers that prove to be priceless to me. I located many items from WW2 that he had kept… manuals; postcards; a detailed map showing his travels, etc. I, also, found something on an aged, folded paper. This paper yielded his valedictorian speech from his graduation from Elderton High school in 1941. I read the paper upon returning home and was much surprised of his insight of the times he was living and how, eerily the writing seemed to relate to our times as well. I copied the speech and sent it to the Leader Times. Happily, the editor felt like me and printed the speech on Friday, June 4th. The irony for me was that the speech appeared, within the pages of the paper, on what would have been my father’s 87th birthday-June 4th. He was born in 1923. As I wrote to the editor, I am sure my father didn’t think while giving that speech at the podium in 1941, he would be drafted the following year and once engaged wouldn’t return home again until the fall of 1945! He was D-Day 13 during that conflict. Last evening I was thinking about things of life. I couldn’t help wondering many aspects of life. What if my father would have been killed during that war? He would have never married Ruth Elizabeth Yount in 1953. I would not have been born in 1955. My sister Ruthie Elaine Smail would not have been born in 1958. Thoughts of the Christmas movie, “It’s A Wonderful Life” came to mind. What if? Such thoughts will boggle one’s mind!! When you think of life and the wars…the Civil War; the World Wars and so on one can only ponder of all of the lives and great people who never were because of war’s action! The speech, “The Legacy of America” appeared in the June 4th edition of the Leader Times. I am honored and proud of my father!! !